The majority of our funding comes from annual events. For more information on these events please email: newappeals@gmail.com. 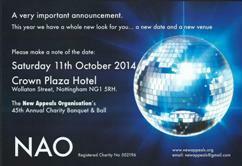 Our annual Charity Ball is a fantastic event, we would be delighted if you could join us. The event will be held at the Crowne Plaza Hotel, Nottingham on Saturday 5th October 2019 from 7.30pm until 1am. Tickets cost £50.00 each or tables of 10 for £500.00 (mixed tables also available) We have plenty to keep you entertained, fantastic 3 course meal, silent auction, raffles, tombola, live auction and dancing into the small hours with our live band. Please contact us for full details. Thank you all so much for your kind support.